The Austin Seven Dynamo has a reputation of being the cars Achilles’ Heel (along with a lack of performance, inadequate brakes, poor lighting etc.) but this may not actually be true. A dynamo works by the principle that if you move a coil of wire within a magnetic field an electrical current will flow in the wire. If you put a magnetically sensitive device (a navigational compass) next to a dynamo that is not revolving it is likely that you will not detect any magnetic field. This is because most of the magnet within the dynamo is produced by electricity in the coils around the outside. These are called the field coils. 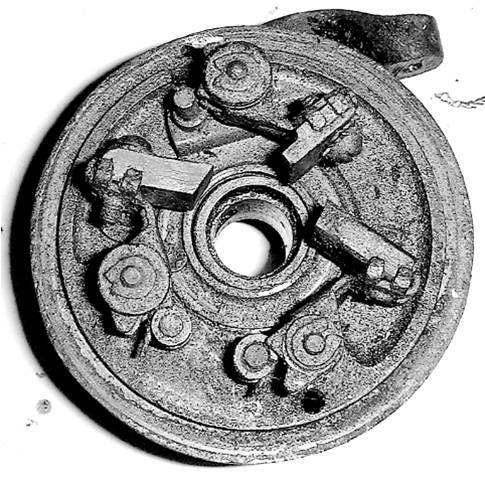 There should be a very small amount of residual magnetism in the metal plates which the coils are wrapped around. Right! So these produce the magnetic field so where is the wire that is moved within the magnetic field. This is the armature which is a long shaft, in the middle of which is a fat sausage with wires laid at an angle from one end of the sausage, around the other end and back to the first end. Each of these wires is a loop. In dynamo terms the more loops the more output from the dynamo. At the end of the sausage where the wires start and finish are a series of copper strips to which the wires are connected. This is the commutator. 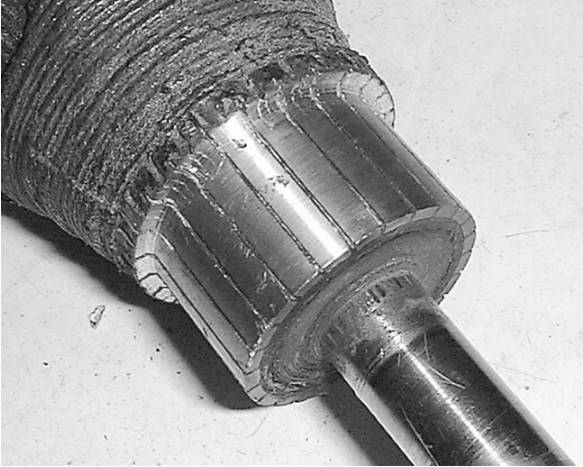 The carbon brushes rub on selected segments of the commutator so that specific loops of wire are joined to the outside world via the brushes and the electricity produced in the coil (which is revolving within the magnetic field) is collected. The position of the brushes and the commutator segments are so arranged that the loop is only connected once per revolution. This makes sure the output from the dynamo is always of the same polarity, that is DC or direct current. An alternator, although having some similarity to a dynamo, produced AC or alternating current. Our Austin Sevens have a third brush which is actually connected to the field coil so that a proportion of the electricity generated by the dynamo is fed into the field coil, creating a magnetic field, which produces electricity when the armature is revolved. At the moment the dynamo starts to turn the residual magnetism starts the generation which is then fed into the field coils until full generation is reached. Back to making your dynamo work. So it doesn’t produce a charge !. There are usually only three basic reasons for failure. Dirty or badly adjusted connections. Incorrect connection to the cars wiring. Well that makes it easier to handle, doesn’t it? Firstly take your dynamo apart. 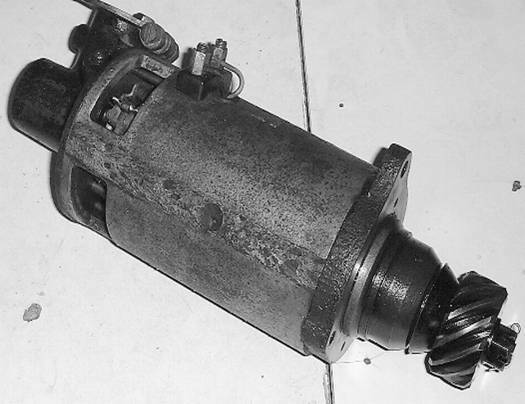 You will need to remove the distributor drive gear on the end of the armature shaft before you can remove the back-plate. 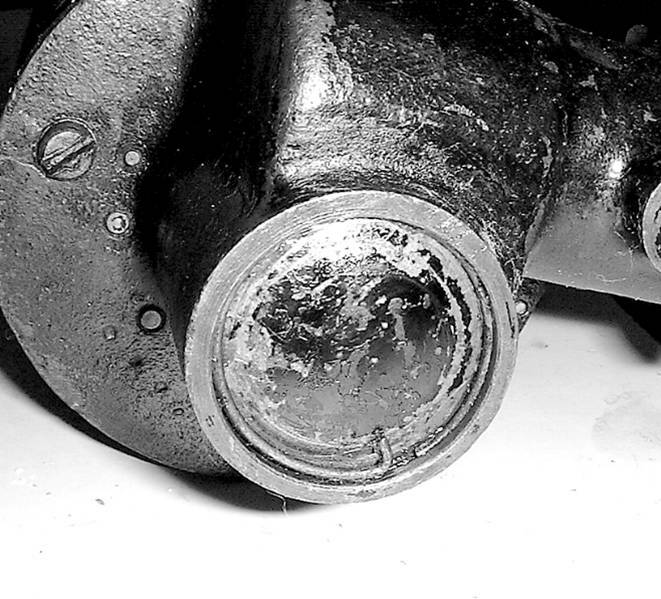 The cover (which incidentally is the same size as the large core plugs on an A7 engine block) is held in with a wire cir-clip which is easily removed with a pair of pliers. 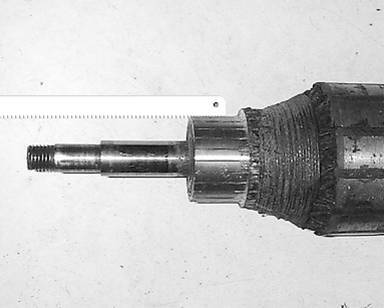 Once the back-plate of the dynamo is removed you will be able to see the commutator and the brushes, disconnect the two wires that go to two of the brushes. You can now slide off the body of the dynamo from the armature. You will now have the armature exposed. Lets check for broken wires. To do this you need either an electrical test meter (very useful things even for those with little electrical knowledge) set to read electrical resistance, a battery and bulb wired with two probes making up the circuit or a proprietary continuity tester which usually either buzzes or glows when there is continuity in a circuit. To check for broken wires there must be continuity between each adjacent segment all around the commutator. If all OK now check between the shaft of the armature and any place on the commutator. There should be no continuity. If the armature has passed these tests then the last thing to do is to clean the commutator with a little meths. or thinners or similar. Each to there own. If it is heavily stained but not rough the a little fine glass paper will help polish the surface. If the surface is rough then the commutator will need to be skimmed in a lathe so find a friend or garage to do this if you don’t have the facilities. 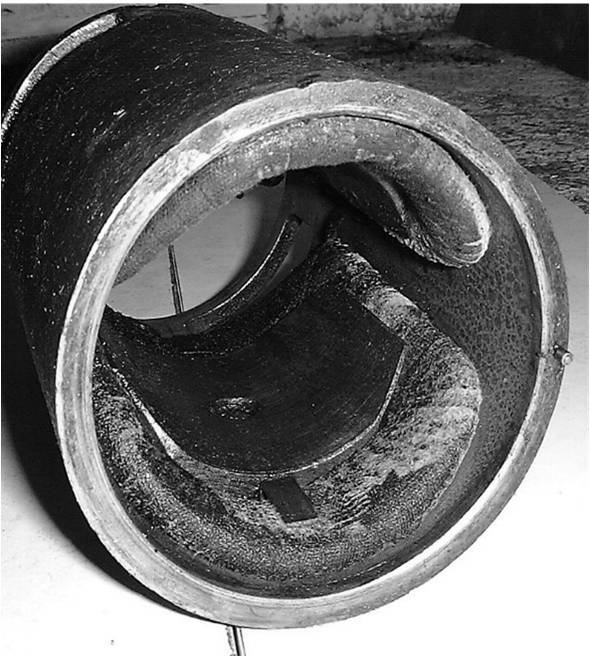 If your commutator is skimmed in a lathe you will need to cut back the insulation between the segments (as in picture on right). The best tool for this is an old hacksaw blade with the sides of the teeth ground off. Work around the commutator making sure that no copper swarf bridges any of the insulating gaps. If all is now well with the armature this can now be put to one side. There are similar tests for the field coils. If you look at the two wires entering the body of the body of the dynamo from the terminals on top you will find that one wire goes to the field windings, the other wire is one of the wires you disconnected from the brushes. Be careful how you determine this as often the two wires both disappear into the covering on the field windings, this is to hold them both firmly. Only one actually goes to the field coils. If you now test between the other wire which went to the brushes and the terminal on the dynamo body which is connected to the field windings you should find continuity, if you do the field windings should be OK, now check between either of these two afore mentioned connections and the body of the dynamo, there should be no continuity. As with the armature if there is continuity in this second test then you have and insulation breakdown and any electricity generated will be earthed out. 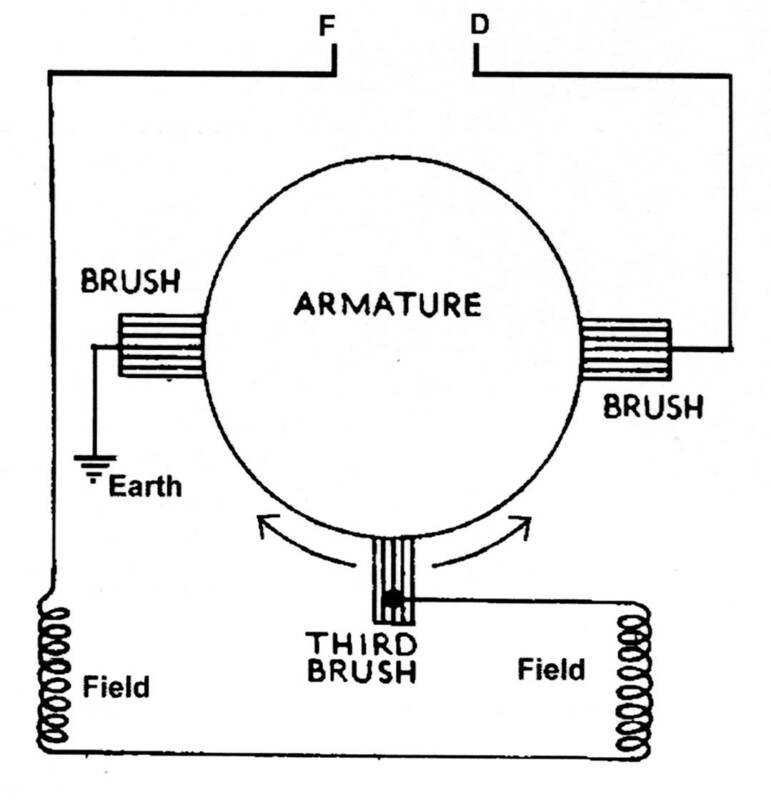 Assuming the field coils and armature have passed their tests you can now turn your attention to the brushes. There are two types of brushes, the early type, which are bolted to a sprung swinging arm, type 35A and the later type where the brush slides in a rectangular tube with a coil spring pressing the brush into the dynamo, type 35M. These are also instantly recognisable in that they have a short wire attached to the brush whereas the type 35A have a slot in them for the fixing screw. Both types of brush should be free to move and should be of sufficient length that they are pressed onto the commutator. If the are worn or damaged then replace them. Check that two of them are insulated from the metal back-plate, one of the brushes is actually connected to the back-plate by a short wire, this is the earth connection. One of the insulated brushes is not directly fixed to the back-plate but can be slid around a short arc. This is the ‘Third Brush’ and the brush is the thinner of the three brushes. When you assemble the dynamo this one is connected to the wire from the field coil. 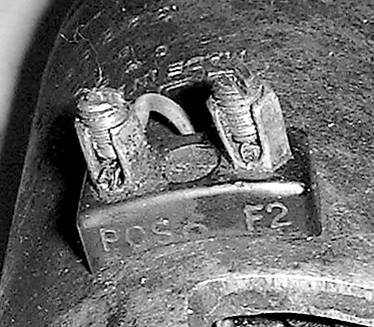 When you check for insulation on these brush assemblies make sure that the insulation at the arm pivot (Lucas 35A) is OK and check that the end of the spring which rests against the peg is also insulated by the insulating collar. If all is now well with the brushes, connect up the two wires to the brushes, the one which goes directly to the terminal block on the outside of the dynamo must be connected to the fixed insulated brush. The wire from the field goes to the moveable brush. Now replace the back-plate onto the dynamo easing the brushes out over the commutator as you slide the plate on. It is a lot easier to say than do but perseverance will win in the end. To test that your assembled dynamo works, connect a short wire between the two terminals on the outside then connect the body of the dynamo to –ve and a lead from the +ve terminal of the battery to the terminals. The dynamo should spin like an electric motor. If you can spin the dynamo at 1000 or more RPM. you can actually measure volts out by connecting a voltmeter to the co-joined terminals and the body of the dynamo. When you connect up the dynamo to the car wiring make sure that the Dynamo output connection goes to the ‘D’ terminal on the control box. This article, written by Malcolm Watts, originally appeared in CA7C Seven Focus in Nov 2000 pp12-17. Question: Which are the correct terminals on my CAV dynamo for Field and D+ ? You will also be able to see three brushes. Looking with the brushes at the top the left hand brush is the field brush. The middle one is D. The right hand one is the earth brush. The clamping allows you to change the position of the Field brush and hence regulate the charge. DO NOT over tighten the clamping screw. The casting is liable to crack and these dynamos are very hard, and expensive, to find!